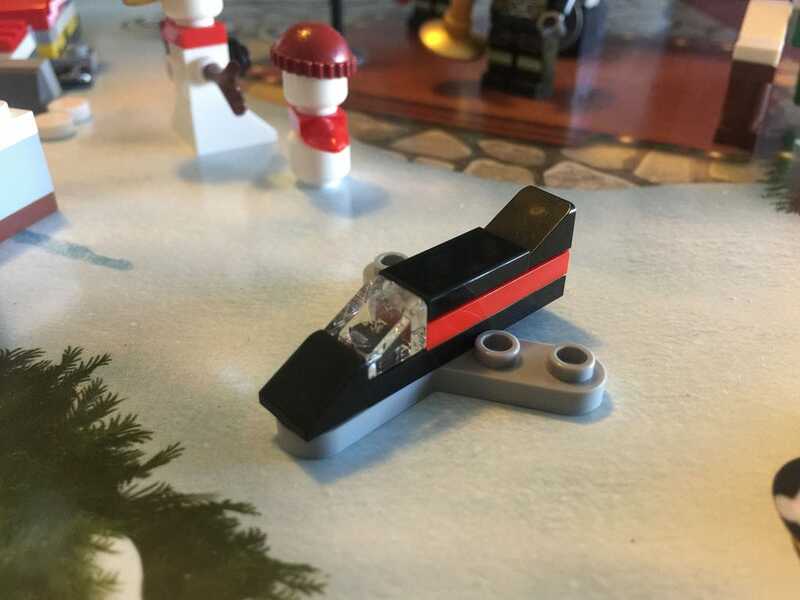 Like last year, with all three of this year’s Advent Calendars, I’ll be posting a daily update to this post. Each day will have an image of the build, and a quick comment, with a final review at the end. If you want to keep up to date with it, use the link to the right of the page – it will be there for the duration of December. I won’t be posting any pictures at all on social media, so you won’t get it spoilt by me! The City display is usually pretty standard – an outdoor scene, with some snow, a frozen lake and some cobblestones. I quite like this one. I wonder what the stage is for? Ok, here we go! Day one in the City is a couple of snowmen. 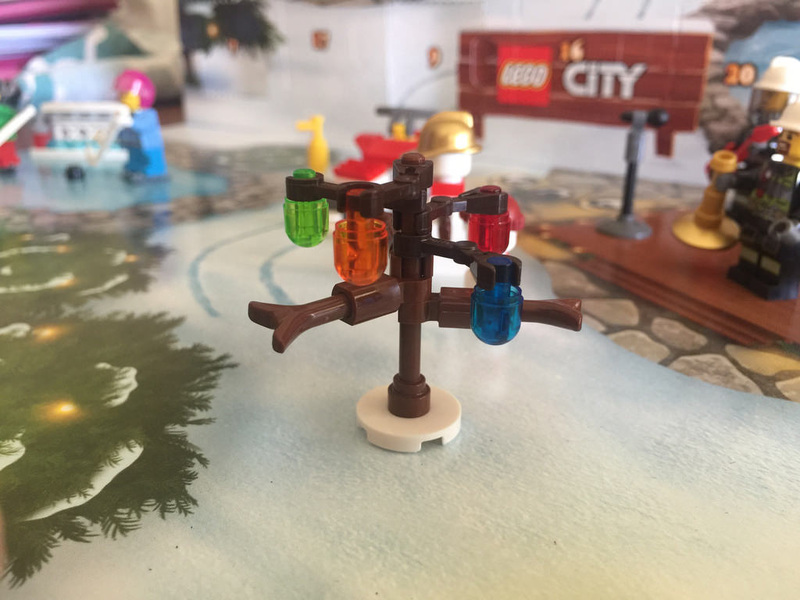 The snowman is a staple inclusion in the City Advent Calendars, but this time we get two – a standard sized one, and a little one! 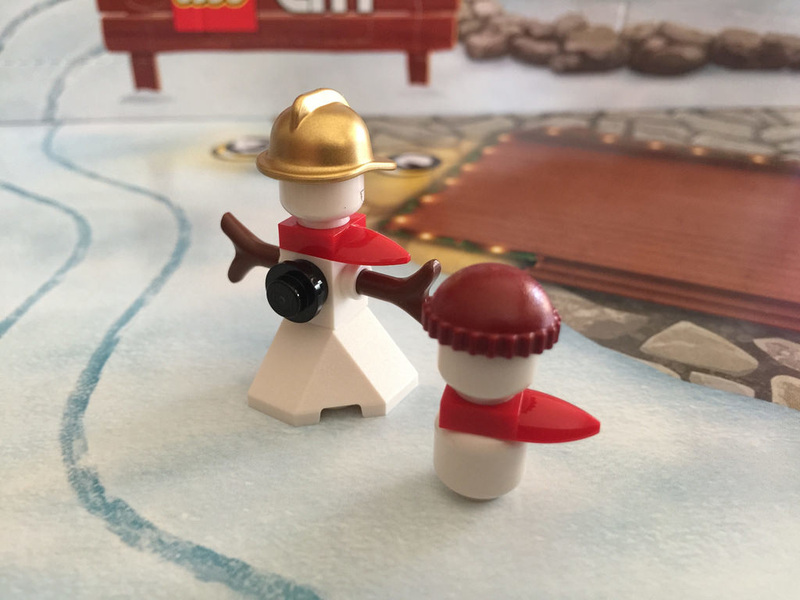 It’s a firefighter centred theme this year, so the main snowman is wearing a gold firefighter helmet – very nice. I really like the use of a red 1×1 tooth as a scarf. It adds to the feeling that it’s cold and windy. 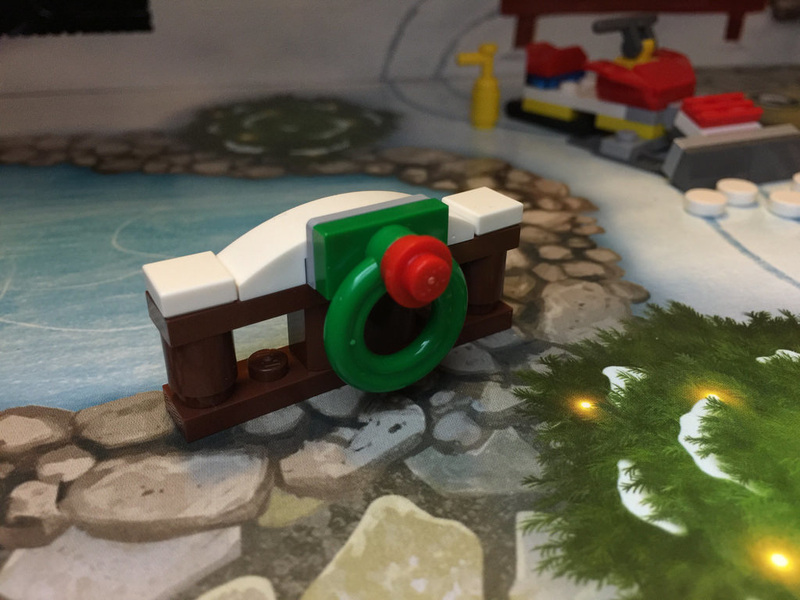 The exciting inclusion for this day is the base of the big snowman. 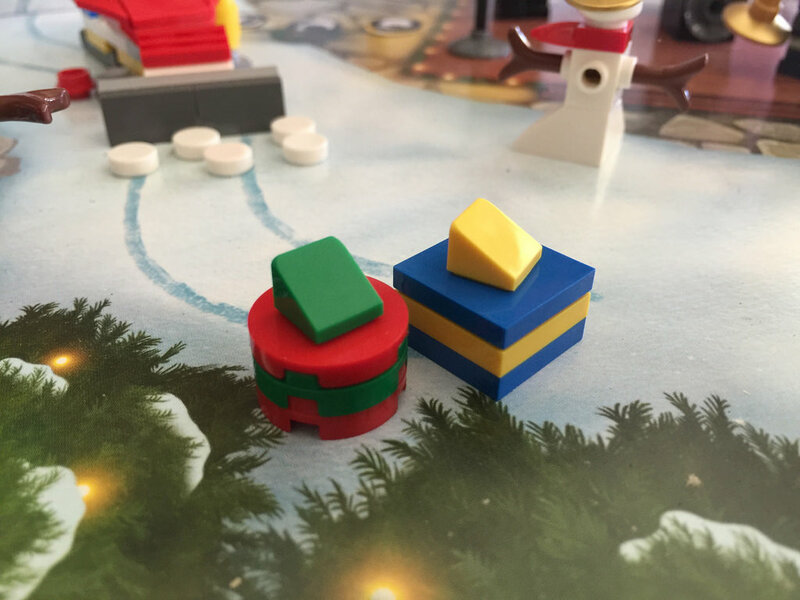 The white 2x2x1 45 degree roof tile has been around for a couple of years, but only appeared in one set in both 2014 and 2015, and then 5 different sets this year. I like it! Today it’s a firefighter guitarist! 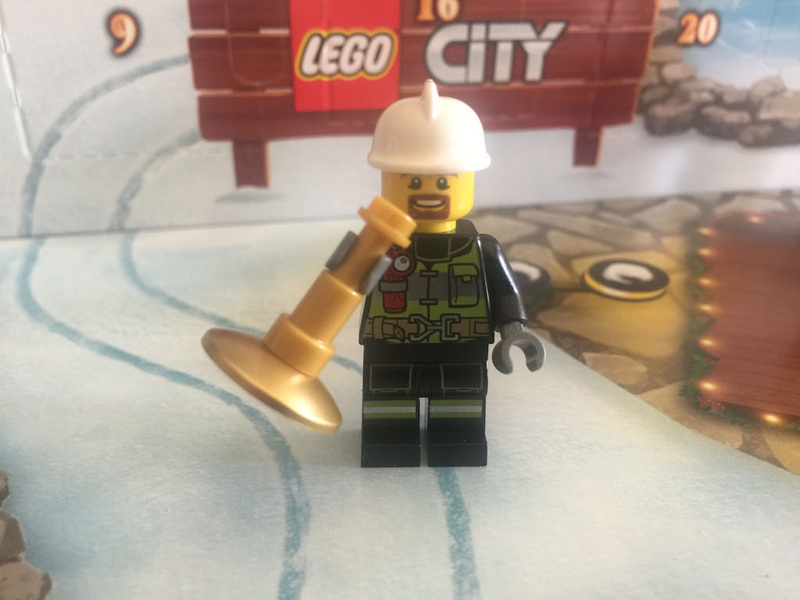 A very strange combination, but a good minifigure nonetheless. And a guitar! Excellent. 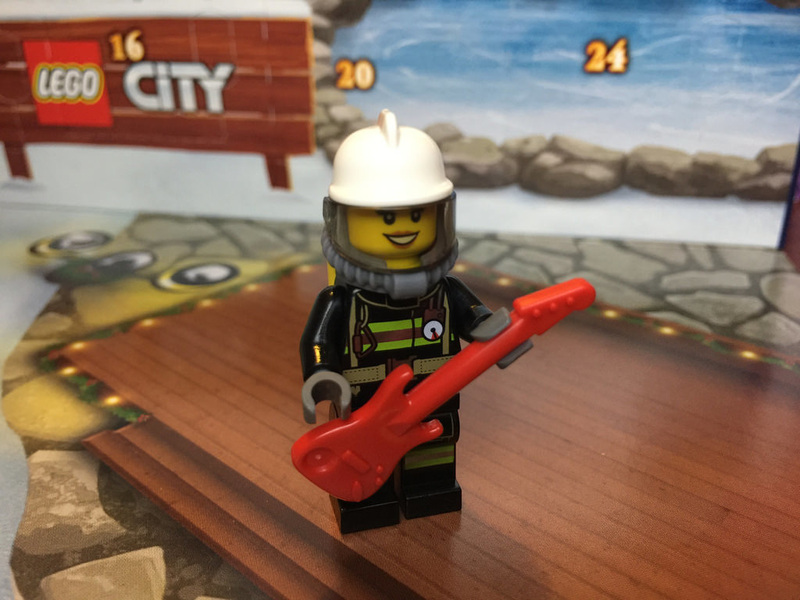 I really like these minifigures – you can never have too many firefighters in a city! Well, you probably can, but I’m not going to say no. There’s back and front printing, but interestingly no printing on the guitar. I wonder if there’ll be a firefighting band? I’m not really sure what to make of this one. 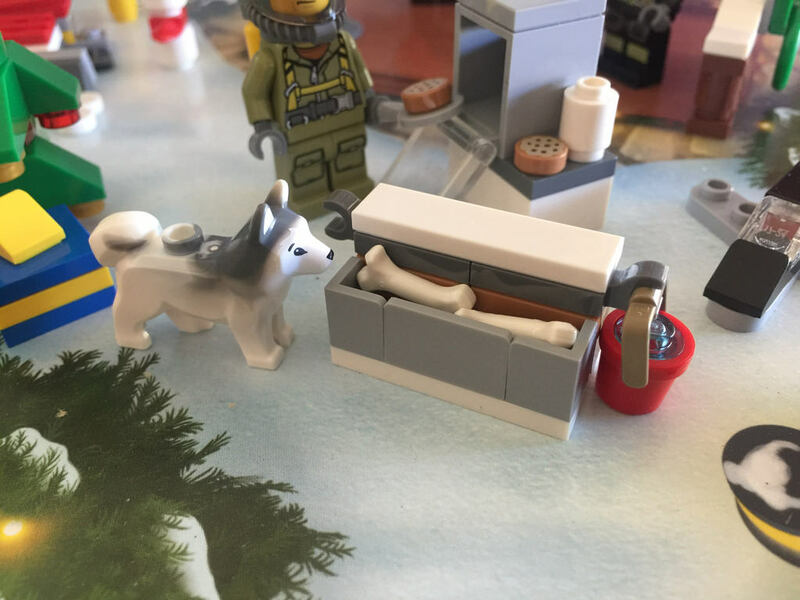 I like the minifigure the printing is good, but what on earth is he carrying? I guessed it as a megaphone, but it could be a bollard, it could be a trumpet…anyone else have any ideas? 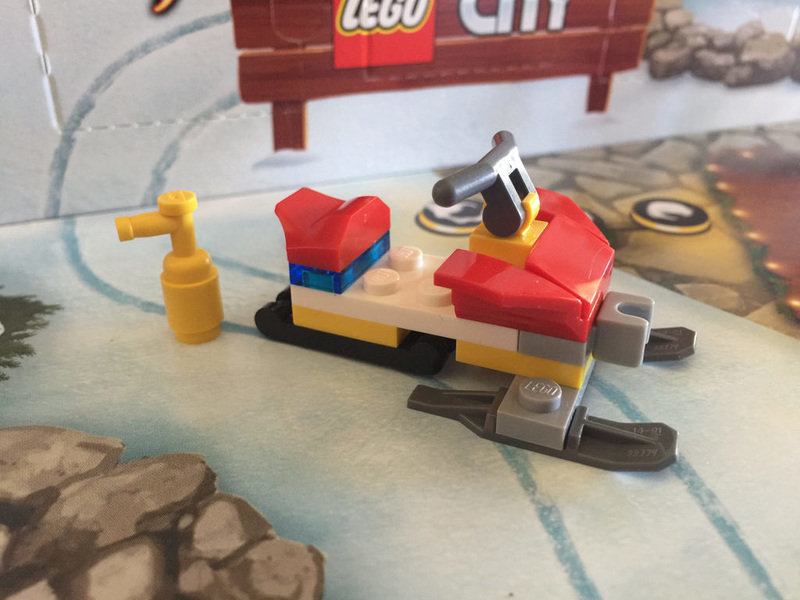 I really like today’s model – a Fire Services Snowmobile! The use of the 1×2 plates with clips at each end for tracks is very clever, and the colour is great. We even get a fire extinguisher to add in. I’m not sure what the ball joint at the front is for though. Most likely a light, but there’s no light for it. Well, we’ve got an answer for what the ball joint was for! 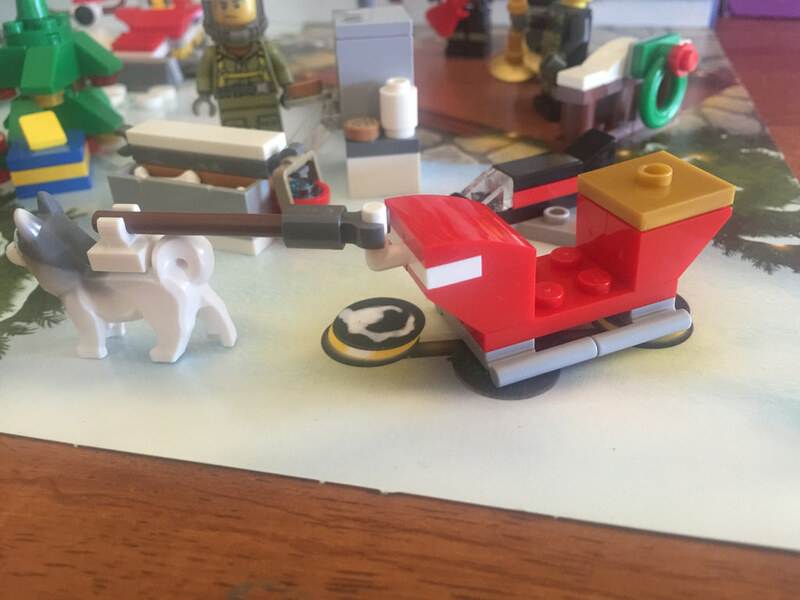 It’s a snowplough. (Thanks to Andrew on Facebook for giving me a hint!). I really like this one. It’s simple, but looks great in front of the snowmobile. The “snow” is a nice touch too. 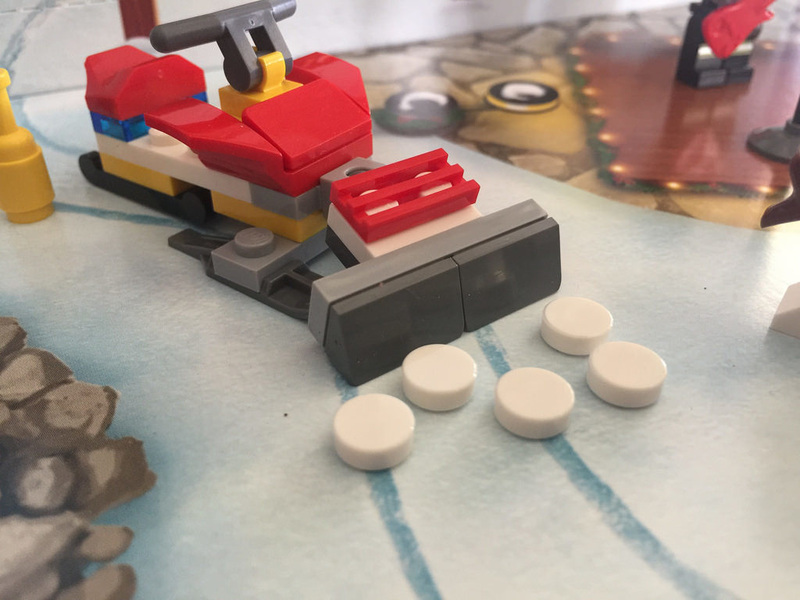 A great model for the kids to scoot around the snow on the picture. I’d love to hear your thoughts on the set so far – let me know what you think! 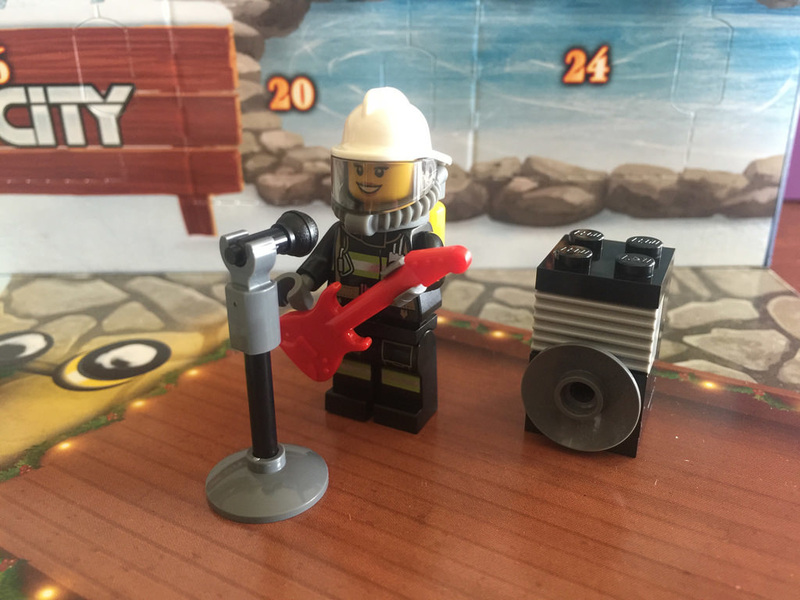 We’ve got another minifigure today, and it’s a nice one! 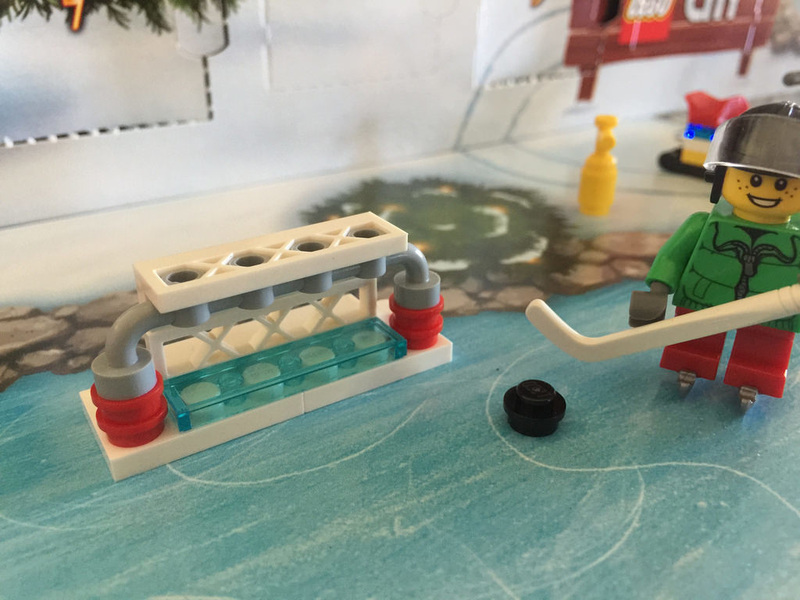 A kid in a green sweater and some skates playing ice hockey! 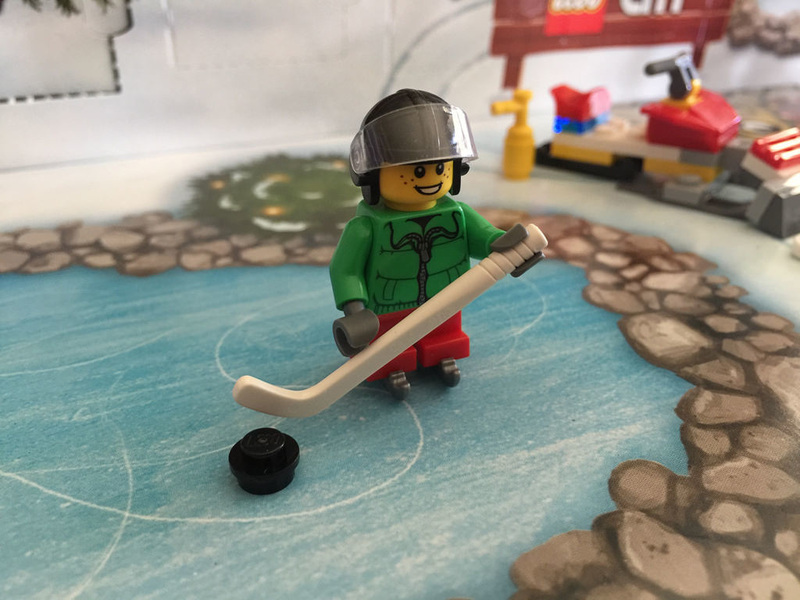 The helmet type is a bit of an odd choice – it is a pilot’s helmet, but the hockey stick is great. 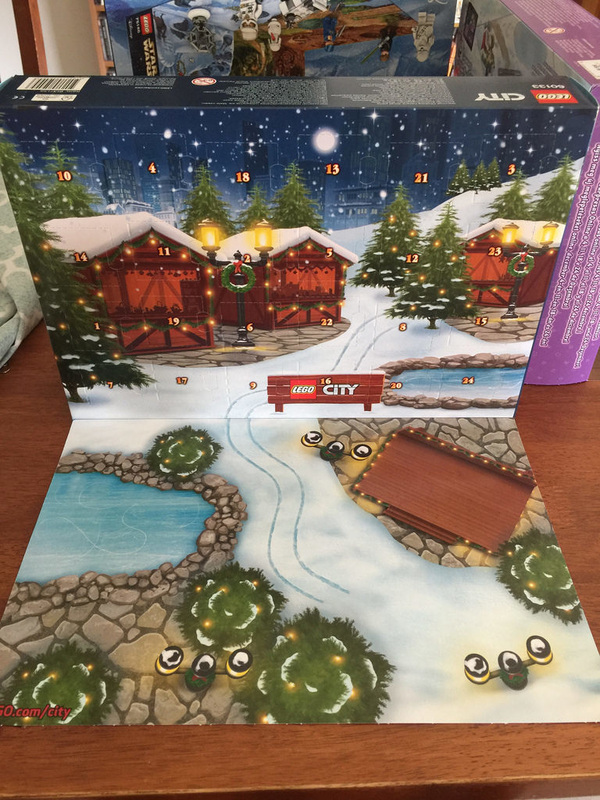 These were introduced last year in 41102: Friends Advent Calendar, which I also wrote a day by day review for, so getting another one is excellent. 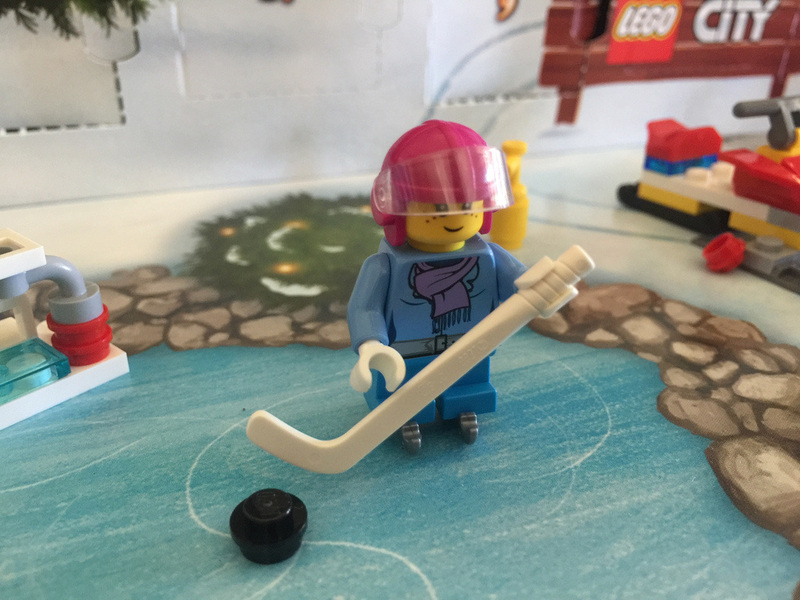 We’re continuing with the hockey section with a goal, and I’m not quite sold on it. I love the way the net has been created, but the white 2×3 plates underneath just ruin the effect. Throw in a couple of white corner plates in and a 1×2 plate instead and have the middle section hollow, but don’t slap a 1×4 trans blue tile there. To me it looks a little wrong. Points for effort though. 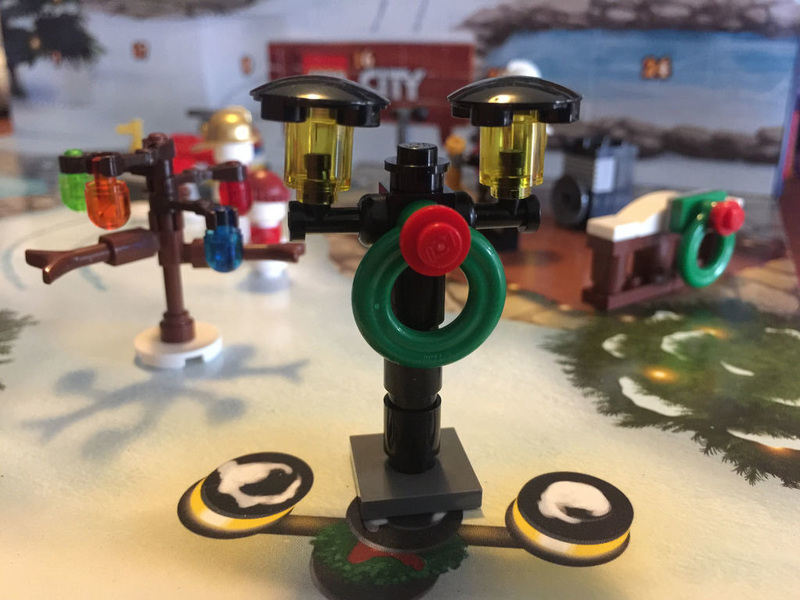 We’re halfway, and the model today is a City Advent Calendar staple – the black lamp post. I quite like this one. It uses some yellow 1×1 bricks upside-down on a black tap, with slide shoes on the top as covers. Even though the slide shoes are upside down, they work rather well. The green and red of the little wreath really accentuates the model. I like it! Now this is a strange inclusion. It appears that this advent calendar is a combination of both firefighers and Volcano Explorers. 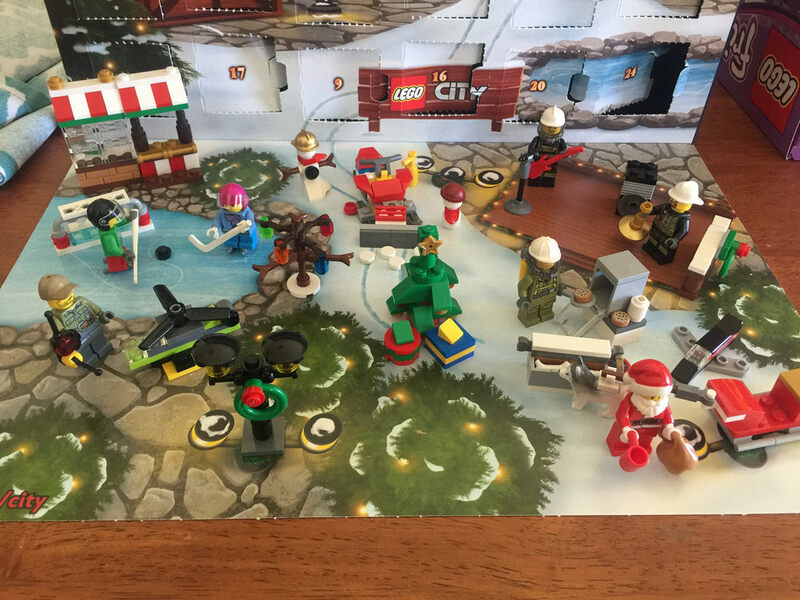 I’ve not had any of these sets before, so this is my first one. He’s wearing a khaki button up shirt with a belt and radio, and it’s got a Volcano Explorers logo on the back. He’s also carrying a very large remote control, so I guess there’s something fun coming tomorrow. Yep, sure enough, there’s something to control with that controller from yesterday. 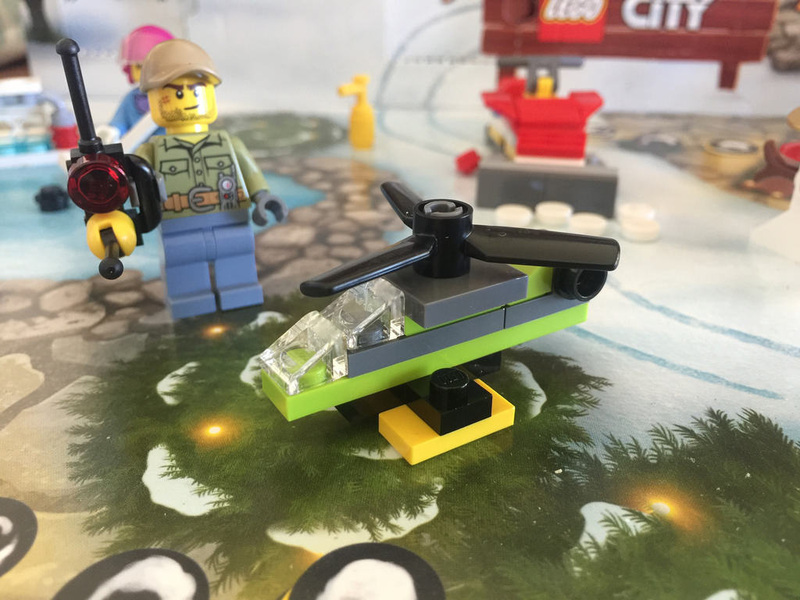 It’s a little Volcano Explorers helicopter, and it looks great. I love the lime green and yellow combinations. I would have liked to see a rear propeller, but at this scale, that’s very difficult. I’m not really sure what to make of this one. It looks to me like a shop window, but there’s only money on the other side, so maybe a shop that only sells money? The build is aesthetically pleasing, with the red and white canopy and the profile bricks at the bottom. 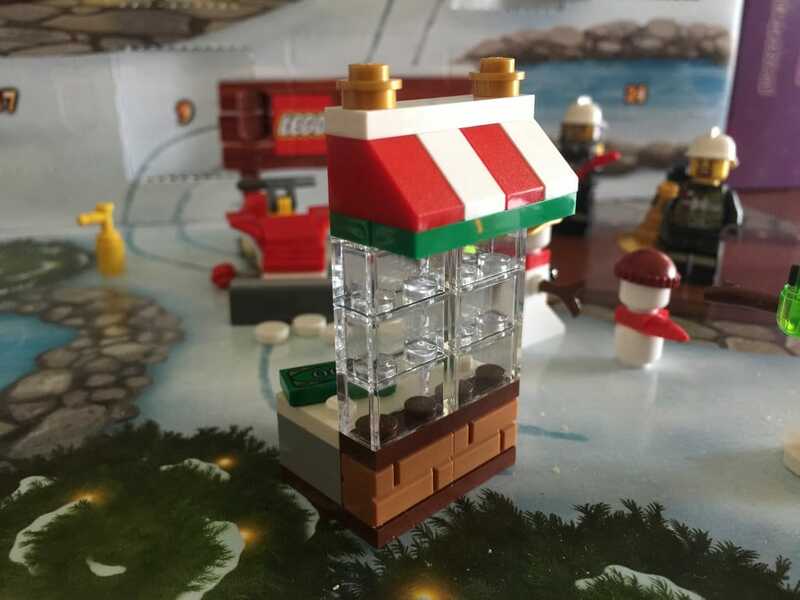 I’m especially happy with the clear 1×2 bricks – I don’t have many of these, so getting six is fantastic. Maybe tomorrow will have an answer for us regarding what it’s meant to be. Well, there’s no answer for yesterday’s build, but we do get this lovely toy plane instead! Not much to say about this one, aside from that I love the use of the Technic rotor as wings and a base. It’s very clever. Now at a first glance, and as an adult, this looks very much like a bar, but it can’t be that! I’m going with a stall of some kind. I like the gold bars at the fornt, and the canopy is another nice one. I don’t think it goes with the other one, but it might. It’s easy to build – I did this one with my 3 year old niece, and she loved it! I wonder what tomorrow will bring? This is another confusing one. 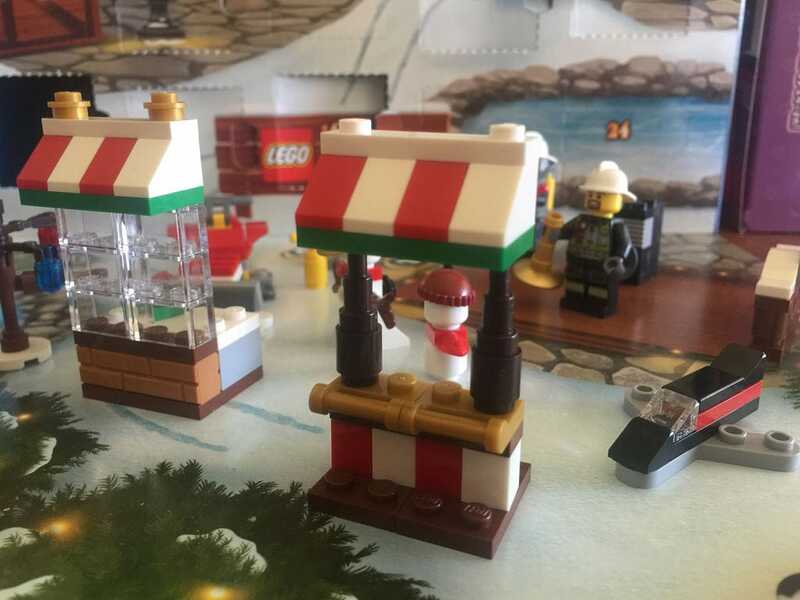 I reckon he’s an extreme baker, but somehow I don’t think that’s what LEGO was going for. I like his clothes, and his cargo pants are great, but why he’s carrying a cookie with such a concerned look on his face, I have no idea. He’s from the Volcano Explorers theme, so maybe he’s the chef? 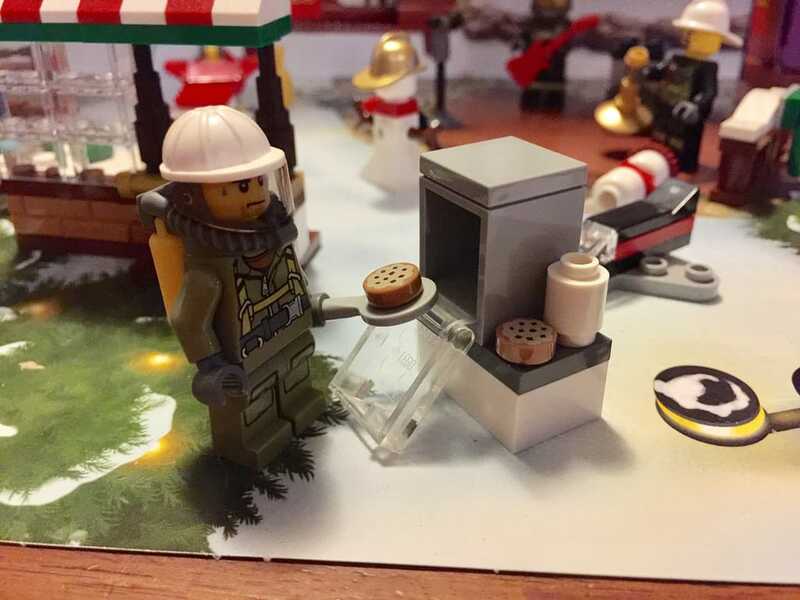 The first day of the last week of the advent calendar brings us a little cookie oven for our Extreme Baker from yesterday. It’s very simple, with a clear door, extra cookie and something in white – a jar maybe? Not much to say about this one. It’s nice to have some more cookies. 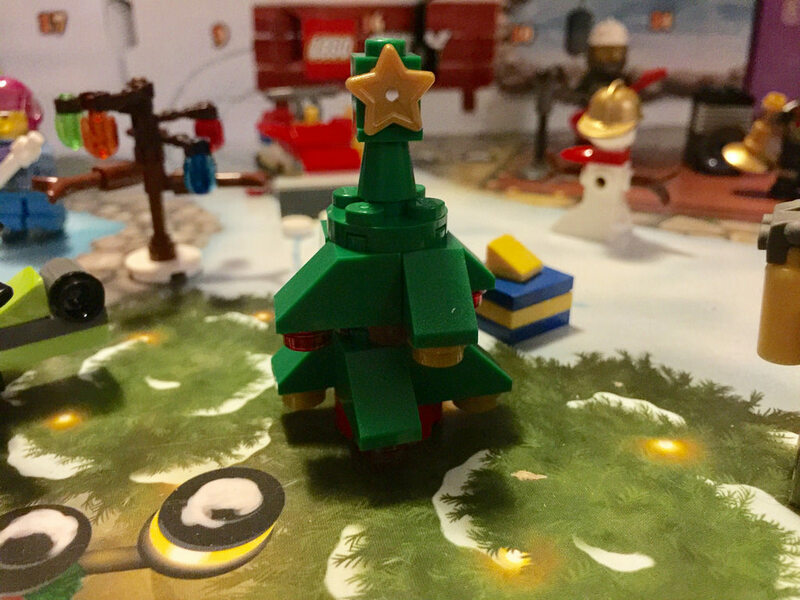 We’ve got the advent calendar staple today, the humble Christmas Tree. It’s a pretty standard build that doesn’t deviate much each year. Not much to say about this one. I wonder what’s left? Three days to go! It’s our first animal for the calendar, and it’s one of my favourites! These huskys are beautiful, as they all have slightly different prints. The food box is quite nice too with some bones and a bucket of water. Two days to go! It’s Christmas Eve, and the busiest man on the planet has decided to show up! Yep, we all guessed it straight away, it’s Santa today. We’ve seen this minifigure a few times before, so he’s not new, but it’s still a great minifigure to have. He’s even got a cuppa with him! 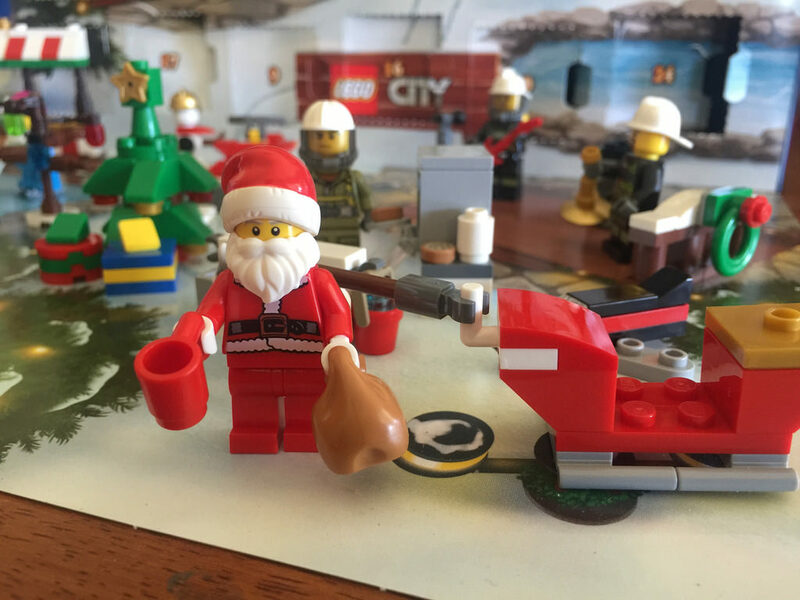 After all, delivering all those presents is thirsty work! 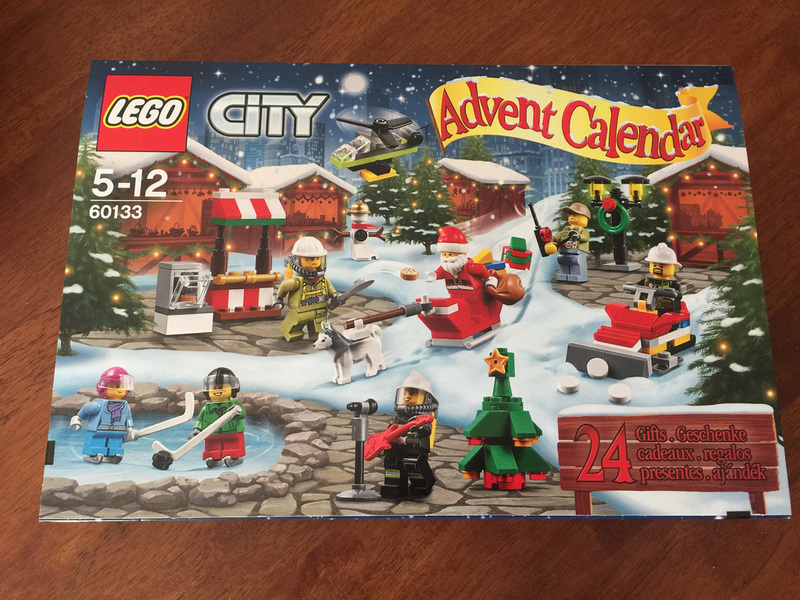 Well that wraps up the advent calendar for the City theme. It’s been an interesting one, with a combination of themes thrown in together – Fire and Volcano Explorers. 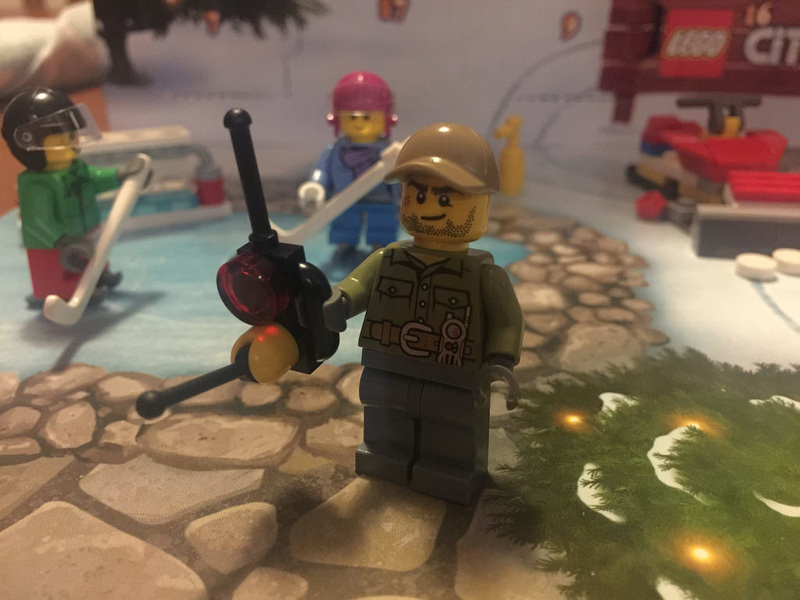 I think it was a little odd, as there’s no real link, but it does mean I get my first Volcano Explorers minifigures, so that’s ok in my book. We’ve had some pretty good models this year, like the snowmobile, and a fair few odd ones (think the shopfronts), but it’s been fun. Next year will be exciting! What were your favourites?